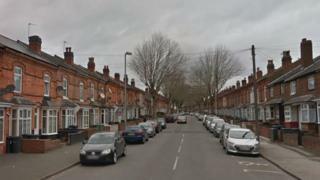 West Midlands Police said the occupant of a vehicle fired at a silver Ford Mondeo in Pretoria Road, Bordesley Green, at about 20.30 BST on Saturday. The teenager was taken to hospital. His injuries are not thought to be life-threatening, police said.